Joe Calzaghe insists he has not entered negotiations to fight IBF light-heavyweight champion Chad Dawson. The American claims his camp have opened talks with world number one Calzaghe as Dawson tries to tempt the unbeaten Welshman not to retire. But Calzaghe told BBC Sport: "I haven't talked to anyone, let alone Dawson, about having another potential fight." Dawson, though, has told Calzaghe he would travel to the UK for a Millennium Stadium super-fight next summer. Calzaghe is considering his fighting future following his points demolition of Roy Jones Jr in New York earlier this month. Unbeaten Dawson, Jermain Taylor and Glen Johnson have all publicly stated they want a big money showdown with Calzaghe, and his previous victims Bernard Hopkins, Jones Jr and WBA super-middleweight champion Mikkel Kessler have all courted rematches with the 36-year-old. But Calzaghe said: "The truth is I have not made my mind up. "It is too soon since my fight with Roy Jones Jr to make a decision one way or the other." He added: "I don't want to make a hasty decision to retire because if next year comes and I actually feel ready and want to fight, I might want to fight again. "But at this moment in time, I don't have the motivation to fight on - but things can change. I don't know is the honest answer." 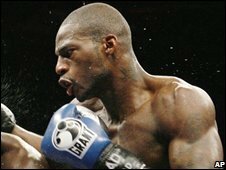 Dawson scored a points win over 39-year-old Johnson in Las Vegas in April but Johnson holds wins over Jones and Antonio Tarver. And 26-year-old Dawson said last week: "There's a little talk going on between the two parties." Dawson is not a big box office star and is one of many "forming a queue," as Calzaghe puts it, to fight him. Calzaghe is caught between the tempting prospect of bowing out in front of his home crowd at Cardiff's Millennium Stadium or retiring from boxing "ahead of the game." But Dawson told BBC Sport: "Me versus Joe is the fight that the boxing world wants to see. "It's the top two in the light-heavyweight division so if Joe should decide to continue, then it should be me against him. "If he doesn't carry on, it would make it easier for me. "But I'd love to fight Joe because he is a tremendous fighter, with an awesome legacy and has established himself as a true hall of famer. "His view in my eyes will not be diminished one way or the other, I'll consider him as one of the great fighters whether he fights me or not. "If he doesn't fight me, I'll move on."